BETHLEHEM, West Bank (CNN) -- In the Christmas Eve morning parades in Manger Square, the tunes were firmly nationalist as Palestinians celebrated the withdrawal of Israeli troops after 28 years of occupation. But there were also wider expressions of universal fellowship in the town where Jesus was born, keeping with the spirit of the season. "We wish for everybody, for every human being -- Christian, Muslim and Jew, to be happy together," said one Bethlehem resident. 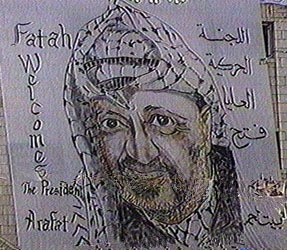 Palestine Liberation Organization leader Yasser Arafat arrived on Saturday and formally proclaimed Bethlehem free. He has been bestowed with custodianship of the Christian holy sites -- not only in Bethlehem, but in Jerusalem as well -- by the Greek Orthodox patriarch. The Palestinian takeover and celebrations have aroused concern among some that politics is overshadowing religion. But the traditional Christmas celebrations aren't totally eclipsed. Pilgrims from many lands joined townsfolk in the spirit of Christmas. (85K AIFF sound or 85K WAV sound) And Arafat, a Muslim, and his wife, born a Christian, will be the guests of honor at midnight Mass in the sixth century Church of St. Catherine. Another sign of the dramatic new times could be seen in the camaraderie on the outskirts of town, where Israeli soldiers and Palestinian police stopped for a morning coffee break between their joint patrols. Carol: "O Little Town of Bethlehem"